Sowing machine should be suitable to all farms,all types of corps, robust construction, also is should be reliable, this is basic requirement of sowing machine. Thus we made sowing machine which is operated manually butreduces the efforts of farmers thus increasing the efficiency of planting also reduces the problem encountered in manual planting. For this machine we can plant different types and different sizes of seeds also we can vary the space between two seeds while planting. This also increased the planting efficiency and accuracy. We made it from raw materials thus it was so cheap and very usable for small scale farmers. For effective handling of the machine by any farmer or by any untrained worker we simplified its design. Also its adjusting and maintenance method also simplified. day it is growing thus demand of food is also increasing. In agriculture we saw various machines. Also there traditional methods are there. Since long ago in India traditional method is used. Also India has huge man power. This manual planting is popular in villages of india. But for large scale this method is very troublesome. 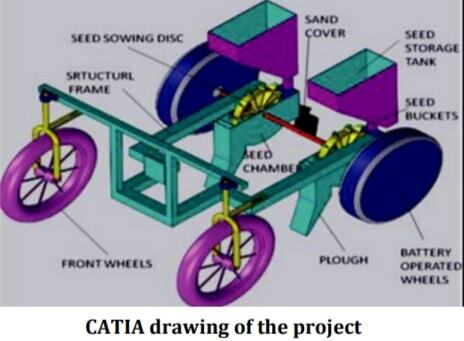 machine which will help the farmer to reduce his efforts while planting. This process of using machines is called as mechanization. Along with mechanization automation also helps to increase the efficacy of the process. Here is the block diagram of the machine and working of it. It also tells the hardware implementation, selection of components and controllers. this system is nothing but 4 wheel robot system on which seed tank, sowing mechanism and metering device is installed to turn it into automatic operated vehicle. This article represents the advanced system for improving the agricultural processes such as cultivation on ploughed land, based on robotic assistance. We developed a vehicle having 4 wheels and operated by DC motor. The machine will cultivate the farm by considering particular column at fixed distance depending on crop. Following are the major parts which are used in this machine. It should be distributed uniformly along the rows. Its transverse displacement with regard to row also considered. Loose soil getting is also prevented. Soil is covered uniformly over the seed. Fertilizer is mixed with seed during placement in the furrow. By fulfilling above factors we get best performance of the seed drill or planter. To improve the performance we need to optimize the above factors also so that we get desired efficacy from the system in economical way. Its design is simplified and components are selected to suit the need of the corps. In the working of the robot seed drill or planter also plays vital role in manipulating the physical environment. The metering system allows the metered or required quantity of the seed in the farm. This system also serves the seed so that seed should not be damaged while working. Increased yielding and reliability in crop. Increased cropping frequency. Increased speed of seed planting. Durable and cheap as low cost materials are used. Since seed can be poured at any required depth, the plant germination is improved. Dependency on labor also decreased. Also it saves time of sowing.